All four lads are back for the first time in a month or so, with Aaron back in the room, and even bringing some quality content with him! The guys chat all about the recent games for the Belfast Giants in the League, as well as bringing highlights, and sometimes (well, mostly if you’re Aaron and the Flyers) some of the lowlights too! We kick in to local action, the Challenge Cup ‘Choose Your Opponent’ draw, the hockey family standing together for great causes and questionable player performances in front of the camera to name a few of this episodes talking points, as well as all the usual league round ups and news! As always, we like to bring you the sources of our fortnightly babbling, and below you’ll find the websites and videos we’ve chatted all about. Meanwhile, in the NHL, Marty and John are sitting pretty for playoffs at the 1/3rd waymark in the season with the Leafs and Predators in prime positions so far. Dave and Aaron however, not so much! First up for the Giants on their 10 game road stint, was a trip to Coventry where they would skate out to a 5-4 (OT) win. Not a bad start! Next up, was a tough trip to Cardiff Bay where the Devils held the Giants until 5 seconds to go in regulation for the Giants to then take the win in the shootout via a gorgeous David Rutherford penalty shot. it ended 4-3 (SO). But it wasn’t to last, as a quick trip down the M1 and M25 to Guildford would prove, as the Flames never looking out of control routed a late surging Giants to hold a 5-3 win. We now know the makeup of the second round of the EIHL Challenge Cup, as the top three seeded teams, Sheffield, Milton Keynes and Belfast, all made their selections at the recent EIHL Board Meeting. The guys discussed the shock pick of the lot, with the Lightning choosing to take on the Panthers…bold move or bad move? Meanwhile, a team nowhere near the Challenge Cup, and indeed nowhere near any other team in the league, languishing at the bottom of the table with only 3 wins and 18 losses, the Edinburgh Capitals seems to be going from bad to worse to embarrassing, as a lack of information from the team, emails regarding payments and social media rumours seem to cast a darkening shadow over the Lion’s Den in Murrayfield (voted the Best Place to experience European hockey by the way!). We would love to hear from any Caps fans with a view on what’s happening there, so please get in touch via Twitter. This week saw the real good that hockey does all around the world come back to us here in Belfast in a big way too, as the Atlanta Gladiators took to social media after a campaign to see one of their awesome charity Captain America jerseys head this way to local hero Ethan McLean. Massive congrats go to Joel Neill of Boomerang Corner, AVFTB and the Giants for getting behind this fantastic cause – sorry we were late to the party! All of us at Door 14 Hockey hope Ethan loves his new jersey when it arrives, and we can’t wait to see you down at the SSE Arena with it on! We also got to throw things back thanks to Eurosport, as we chatted about their piece recounting the biggest moment in British hockey history in 1936, as they took home the gold medal from the Winter Olympics after defeating Canada. Keep your ears peeled, you may recognise the odd name!. However just this week, British hockey lost John Murray a great servant, and the last surviving member of any Olympic representative team for the country. A great loss. John Murray: 1948 Winter Olympic Hockey Participant for Team GB. The Nashville Predators got in on a proposal pre-game as they walked out to the ice, with Viktor Arvidsson and P.K. Subban doing their bit to make sure this guy got the “YES“! 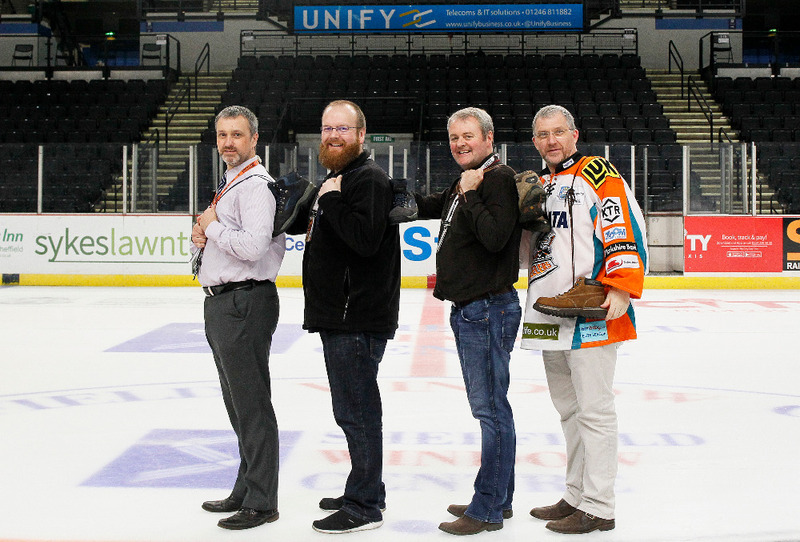 Here in the EIHL, David Simms of the Sheffield Steelers and his friends, will once again be lacing up the boots to walk for charity, and this time there’s a Belfast link. Not only will Dave and co. be walking from Sheffield to Belfast, but they will also be raising money for both the Amy Usher fund, in memory of Steeler fan Amy Usher who sadly passed away and was the inspiration for their first walk for charity, as well as for Belfast’s own warrior Blake McCaughey. We know there’s plenty of mixed feelings about the man, but there can be no question about the worthiness of this cause. We’re right behind this one, and we’re sure the Giants fans will dig deep. You can click the photo below or click here to go to their gofundme page and donate some money. Simms and Co. get their boots ready! Meanwhile, the IIHF are in discussion about the potential of a complete ban on Russian participation at the 2018 Winter Olympics after a drug riddled time at Sochi in 2014, as well as their ‘track’ record in the Summer Olympics. The guys discuss how this, along with previously discussed issues in performance by Canada and Team USA could impact further on the level of competition at the coming Olympic Games in January. Also, we chat how the Finnish netminding duo play with each other in Nashville….hmmm….we may need to re-phrase that! Could we be heading to an Olympic hockey tournament without this jersey? The NHL has kept relations with it’s youngest fans at an all time high this month too, as a young hockey fan (known only as Ben) with a goal to one day officiate the game has taken his first steps thanks to NHL referee Tom Chmielewski and a care package that us here at Door 14 Hockey are sure should be sent around some of the Stripeys in the Elite League! Click the photo below to read more. We’re especially jealous of the centennial patch here! Ben’s awesome care package, rule book and all, from Tom! This time around, the three stars were very goal and NHL heavy, with only John keeping things local to the EIHL. Marty surprised John by heading to Nashville for the second time this podcast and selecting none other than the Preds’ Viktor Arvidsson for a beauty of a goal against the ‘Canes. Aaron, having done his homework, but unfortunately having stuck with his Philadelphia Flyers, chose Michael Raffl for a slick, if pointless, backhand goal as the Pens would still skate out with the points in OT (sorry Aaron! Yes, John is aware the Preds’ also lost following Arvi’s goal too!). John this time chose to go with the performance of the Belfast Giants against the Cardiff Devils, to come back from behind in Ice Arena Wales and get not only an equalising goal with 00:05 left on the clock, but a shootout winner too courtesy of David Rutherford (see the top of the page for highlights of that game). Dave rounded out the segment by heading to Minnesota, as he often does, and rather than either praise or crucify Wild netminder Dubnyk this time, went for a defence-man instead and we can’t argue with a finish like Matt Dumba’s OT winner against the Blues! No Door 14 Hockey Podcast would be complete without a visit to the land of EIHL DOPS, and this time, there was plenty to chat about! Former Steeler Andre Deveaux is this week’s main focus, after his incident packed night against the MK Lightning saw him banned a total of 6 games for multiple infringements, including the most dangerous slew footing we’ve ever seen, as well as not being able to handle criticism from referees. Deveaux’s release from his contract means the Steelers will play 6 games with an import benched. See the EIHL DOPS video below. We also quickly discuss penalties to Flames’ Thomas Nechala (3 games for boarding, including allowance for an injury sustained during the play) and Devils’ Gleason Fournier (1 game for checking to the head). Finally, we chat all about the 3 game ban to Belfast Giant Jonathan Ferland, and this time the guys…well, John and Dave/Marty have to agree to disagree on the review and how lucky or unlucky Ferland has been. Probably just as well we’re not in charge! You can see the Ferland DOPS review video below. Meanwhile, during the same game in Cardiff, Giants’ equipment manager Jason ‘Taff’ Ellery was reviewed on the back of a referees report, and subsequently banned from the bench from 2 games….we still await Taff’s video review…. This episode wraps up with the guys chatting about their favourite and the funniest promotional and advertisement videos that hockey players have been involved in, all stemming from the gold that is the Pitsburgh Penguins Phil Kessel appearing on the club’s Twitter feed to get the fans worked up for their Star Wars night…only problem, we’re not convinced he’s ever seen Star Wars! Darth Kessel. Need we say more? Here are a couple of the others that co=aught the guy’s eyes! Have you seen any others?? Let us know! Check out Ovi and a rather ‘bulky’ looking mop-topped Phil Kessel! Blink and you’ll miss the Hanson Brothers in this one! It’s not just the NHL who can produce the gold on camera either, as our own Belfast Giants have proved time and time again! And of course, who could forget this piece of Belfast Giants gold form way back in 2010. It is Christmas time after all! As always, we hope you enjoyed this edition of the Door 14 Hockey Podcast, and we want to hear from all of you out there! So, get in touch with us on Twitter, Facebook and Instagram and let us know what you think we should be talking about in the world of hockey!